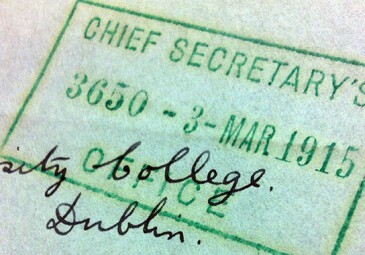 UCD Archives, IE UCDA P57/134. Part 3 of our Centenary Special. 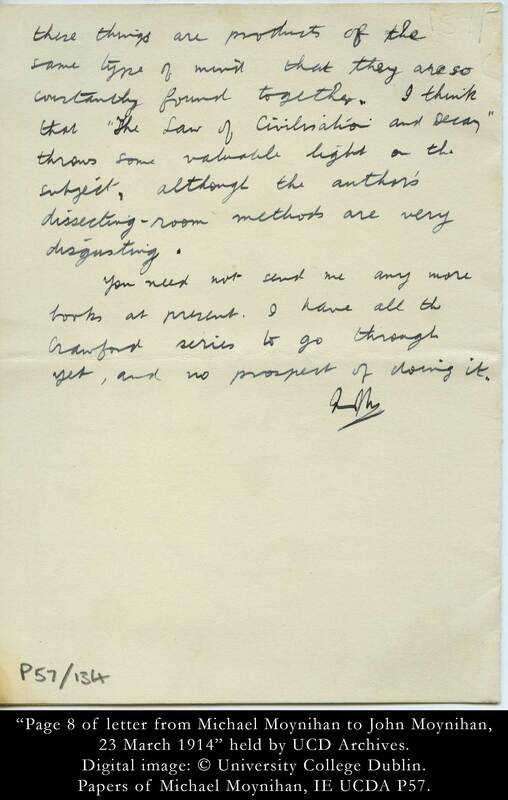 Original letter (and analysis by Conor Mulvagh) can be viewed here. 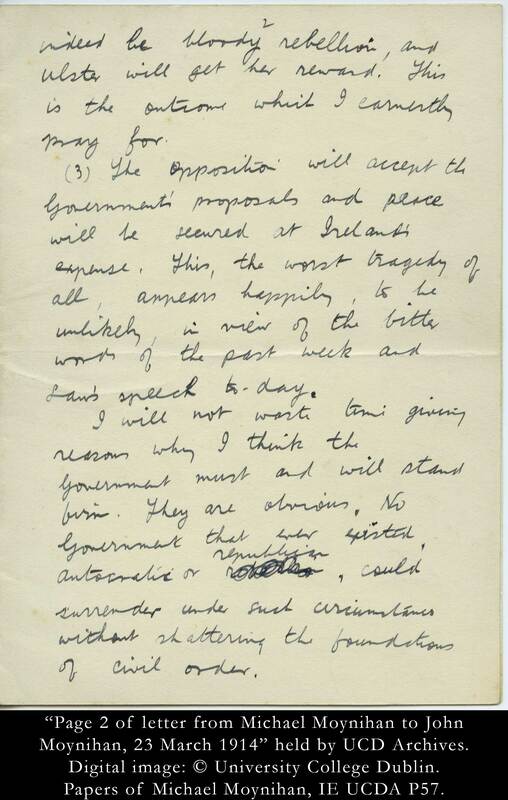 All images from the Michael Moynihan Papers, courtesy of UCD Archives. 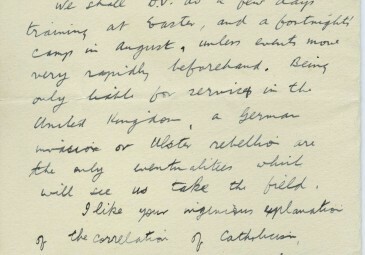 This month’s ‘From the Archives’ document gives an insight into the state of Irish nationalist feeling both towards Ulster unionists and also towards the officers stationed at the Curragh Camp, in county Kildare who, at the time this letter was written had just returned from the War Office in London with written assurances that they would not be pressed into service in Ulster in any future imposition of Home Rule on the province. More on the Curragh Crisis of late March 1914 can be found here but this essay will focus specifically on the document at hand as it covers much more than events at the Curragh. 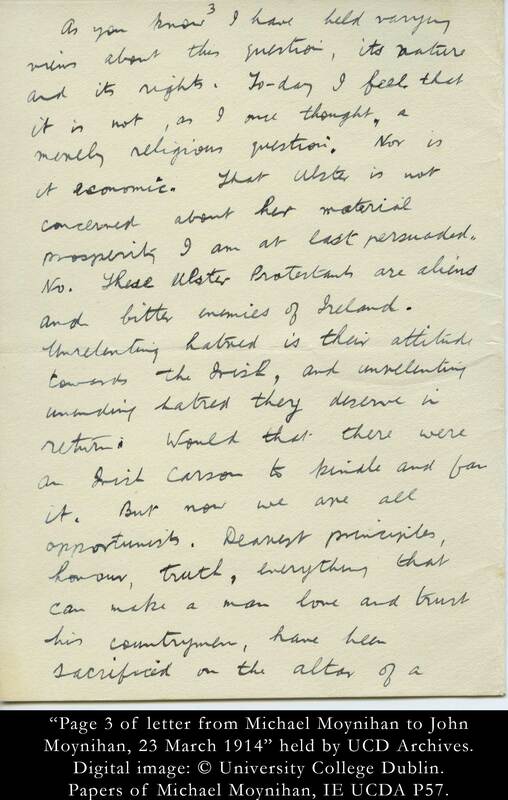 Writing to his younger brother John at home in Tralee, Michael Moynihan was working for the Revenue Commissions in the British Home Civil Service when he wrote this letter in March 1914. 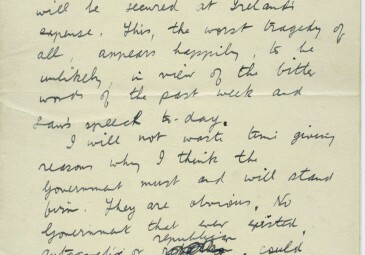 The entire surviving correspondence between Michael and his brother and mother (Mary) is held in UCD Archives and it was published by Deirdre McMahon in 2004. 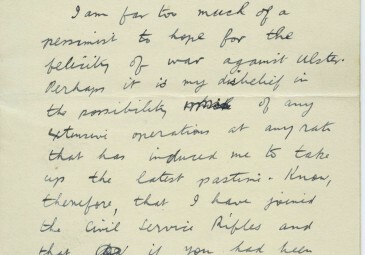 McMahon has successfully rehabilitated these forgotten voices, and the correspondence from early 1914 is among the most significant and revealing aspects of a correspondence that endured for the rest of Michael Moynihan’s life. Having left his studies in UCD to take up an appointment in the British Civil Service, Michael Moynihan moved from his post in the Dublin office of the Revenue Commissioners to their Croydon office in autumn 1913. 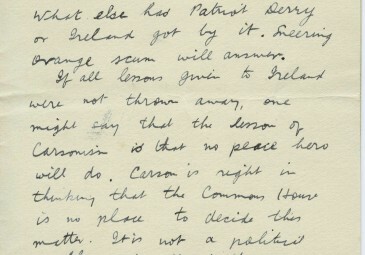 In this letter, the reader is witness to the intense emotive impact that the deepening Ulster crisis and especially the dénouement of the Curragh crisis had on Irish nationalists. There are deep sectarian undertones to Michael Moynihan’s writing in this document. 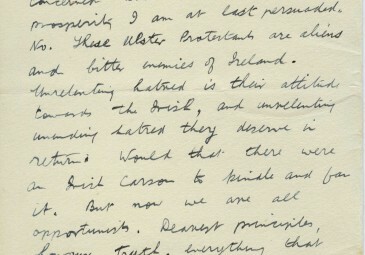 His comment about Ulster Protestants as ‘aliens and bitter enemies of Ireland’ epitomises an exclusivist and religiously-orientated definition of Irishness which was on one hand well represented in provincial Ireland and, on the other hand, starkly at odds with Irish republicans and advanced nationalists at this point. Whereas the religiously diverse triumvirate of Antrim-men then at the centre of the Irish volunteers – Roger Casement the Presbyterian, Bulmer Hobson the Methodist, and Eoin MacNeill the Catholic – all welcomed the existence of Edward Carson’s Ulster Volunteers and made (albeit tokenistic) efforts to reconcile and unite the Irish and Ulster Volunteer forces, here we see Moynihan with a very different view of Carson. The Protestants of Ulster are there – very much there – and there they will remain. (I should like to know how you propose to exterminate them.) If I were to admit that their presence is an evil, which I don’t, then I think it is to make the best of it … If our future history is not to be, like our past, a record of failure and disillusion and bloodshed, we must change all that. By this, the younger brother in Ireland chastened the more hot-headed Michael, removed from the rapidly changing nature of Irish life by his career in London. Even Pádraic Pearse held esteem for Carsonism, and believed that ‘[an] Orangeman with a rifle [is] much less ridiculous than the nationalist without…’. However, for Michael Moynihan, the Dublin-born Carson was not even an Irishman. This type of ‘two-nations theory’ as it was referred to at the time was an extremely divisive concept in Irish political debate. For nationalists like John Redmond, there was no prospect of reconciling Ulster and maintaining a united island under Home Rule if one accepted the belief that Ulster unionists were a separate ‘race’. Thus, more conciliatory nationalists, including John Moynihan, tried to encourage a civic rather than an ethnically based image of Irishness in this period. 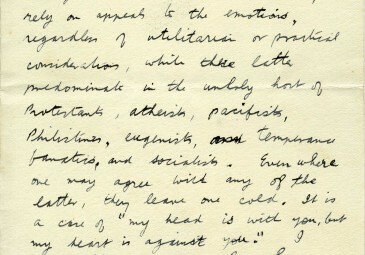 The importance of Michael Moynihan’s closed and antagonistic concept of Irish racial identity in his letter of 23 March underlines the dissonance between high political message and the sentiments of individual nationalists, even from an educated and wide reading individual such as was Michael Moynihan. 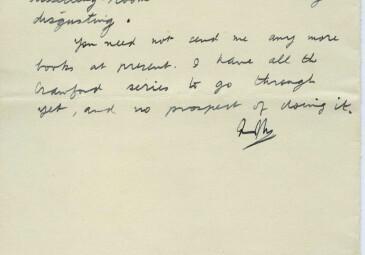 The bellicosity of Moynihan’s outlook following the Curragh crisis is striking. 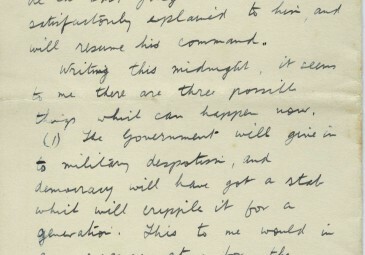 In outlining three probable outcomes in its wake, the solution which he himself hopes for is ‘bloody rebellion’, where Ulster will ‘get her reward’. 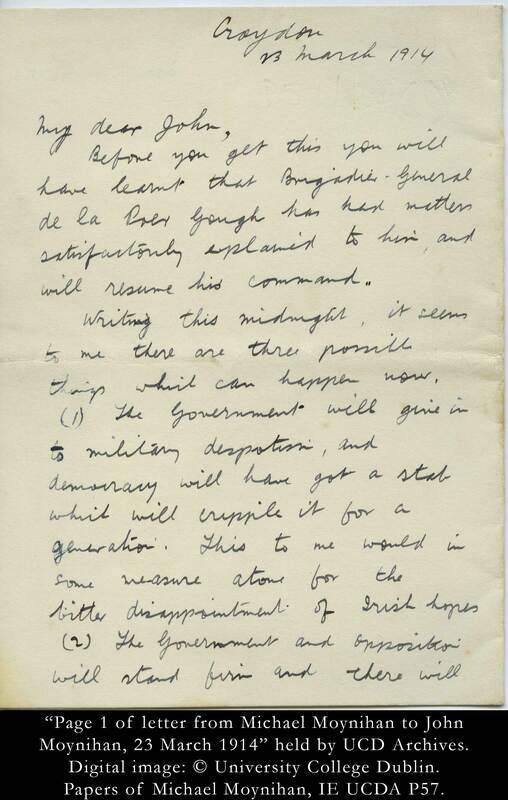 In Kerry, Dublin, and then London, Moynihan was far removed from the realities of the situation in Belfast. 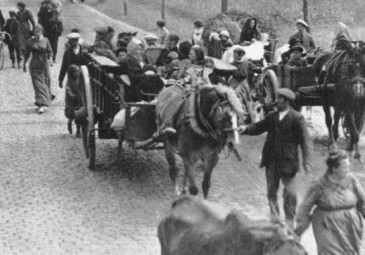 While many republican and Home Rule politicians worked to avoid the boiling over of tensions in Ulster, cognisant that a civil war in the province would likely witness barbarity not seen since the 1690s. Moynihan’s own action was decisive. 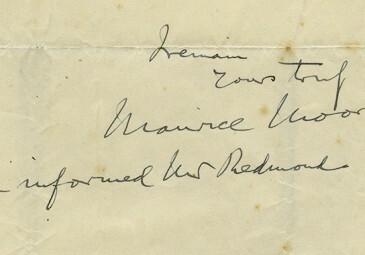 As Deirdre McMahon argues, he became one of the generation of 1914, and joined the Civil Service Rifles, a territorial unit in London several weeks before this letter was written. Michael Moynihan had become enamoured of the cult of the gun. 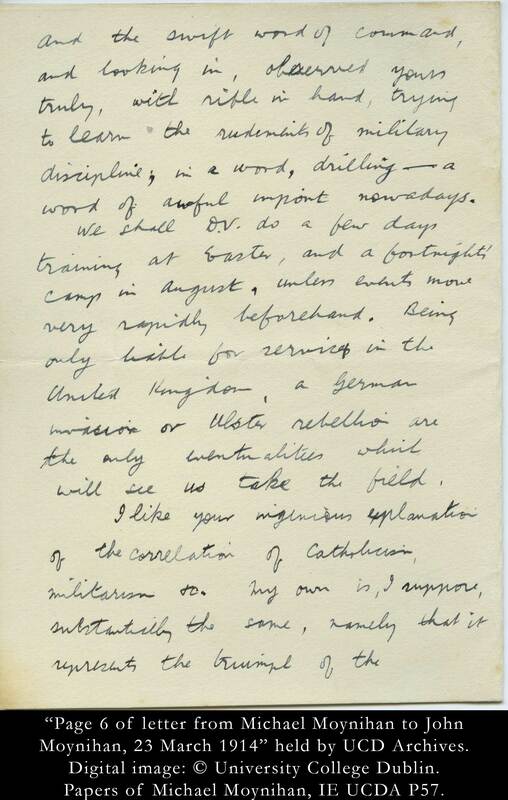 Just as thousands of men in Ireland flocked to the Ulster Volunteers, the Irish Volunteers, and eventually the recruiting depots of the army in 1914, Moynihan enthusiastically looked forward to moving from the home front to the western front. His mother refused to grant her blessing on Michael’s desire to fight in Europe but, when conscription came to Britain in 1916, Moynihan took the opportunity to sign up for foreign service. Michael Moynihan became a 2nd Lieutenant in the 8th (Irish) Battalion of the King’s Liverpool Regiment. He was killed in action just five months before the end of the war. The official War Office report on his death shows that he was killed by friendly fire. Late on the night of 2 June 1918, Moynihan doubled down a trench to fetch stretcher bearers for men who had been injured on a patrol which he had led. As he approached the sentry on guard, he failed to respond to challenges issued and was shot at close range. He died shortly after and is buried in Doullens cemetery, in the Somme. By tracing the impact of historical events, from the Ulster crisis to the First World War on the individual, one can begin to appreciate the impossibility of interrogating collective motives for the actions of Irishmen during the revolutionary decade. There was a clear link between events in Ulster and Michael Moynihan’s decision to join the civil service rifles. From there he eventually found himself as an officer on the western front. 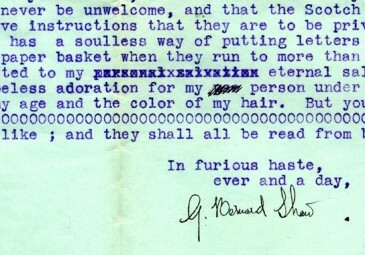 He thought deeply about his decisions but, as this letter so clearly illustrates, he could also act impulsively. 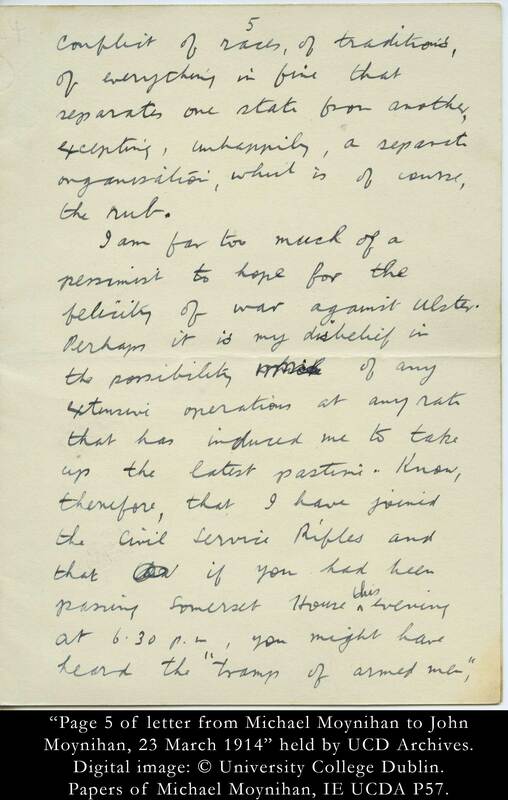 Voicing fears of Ulster rebellions and German invasions in March of 1914, Michael Moynihan’s letter attests to the uncertainty and volatility of life in that extraordinary year. He could not have foreseen how different his life would be in the months and years ahead. In this way, his personal experience adds further credence to Christopher Clark’s thesis. Perhaps Michael Moynihan was yet another innocent sleepwalker, swept along by forces he struggled to comprehend and explain towards his tragic and premature death. Before you get this you will have learnt that Brigadier-General de la Poer Gough has had matters satisfactorily explained to him and will resume his command. Writing this midnight, it seems to me that there are three possible things which can happen now. The Government and Opposition will stand firm and there will [end p. 1] indeed be bloody rebellion, and Ulster will get her reward. This is the outcome which I earnestly pray for. The opposition will accept the Government’s proposal and peace will be secured at Ireland’s expense. This, the worst tragedy of all, appears happily, to be unlikely, in view of the bitter words of the past week and Law’s speech to-day. As you know, I have held varying views about this question, its nature and its rights. To-day I feel that it is not, as I once thought, a merely religious question. Nor is it economic. That Ulster is not concerned about her material prosperity I am at last persuaded. No. These Ulster Protestants are aliens and bitter enemies of Ireland. Unrelenting hatred is their attitude towards the Irish, and unending hatred they deserve in return. Would that there were an Irish Carson to kindle and fan it. But now we are all opportunists. 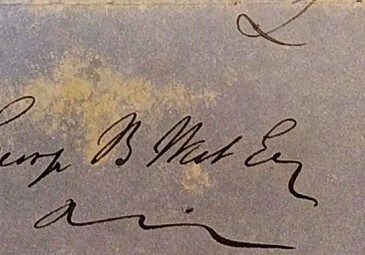 Dearest principles, honour, truth, everything that can make a man love and trust his countrymen, have been sacrificed on the altar of a [end p. 3] Peace that heareth not. Peace sitting under her olives and slurring the days gone by. Patriot Derry arouses even English Unionist admiration by sacrificing her route march. What else had Patriot Derry or Ireland got by it. Sneering orange scum will answer. If all lessons given to Ireland were not thrown away, one might say that the lesson of Carsonism is that no peace hero will do. Carson is right in thinking that the Commons House is no place to decide this matter. It is not a political problem at all, in the sense of a divergence of opinion amongst the citizens of a state. It is a [end p. 4] conflict of races, of traditions, of everything in fine that separates one state from another, excepting, unhappily, a separate organisation, which is of course, the rub. 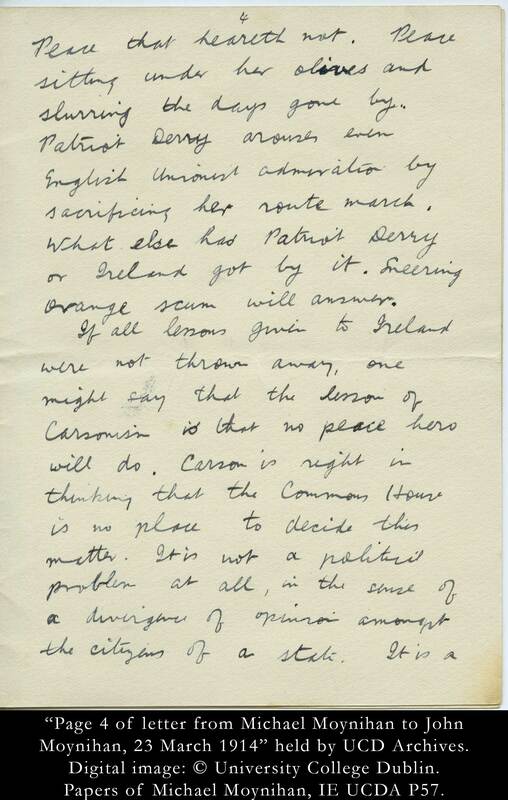 I am far too much of a pessimist to hope for the felicity of war against Ulster. Perhaps it is my disbelief in the possibility of any extensive operations at any rate that has induced me to take up the latest pastime. Know, therefore, that I have joined the Civil Service Rifles and that if you had been passing Somerset House this evening at 6.30pm, you might have heard the “tramps of armed men”, [end p. 5] and the swift word of command, and looking in, observed yours truly, with rifle in hand, trying to learn the rudiments of military discipline, in a word, drilling – a word of awful import nowadays. We shall D.V. do a few days training at Easter, and a fortnight’s camp in August, unless events move very rapidly beforehand. Being only liable for service in the United Kingdom, a German invasion or Ulster rebellion are the only eventualities which will see us take the field. I like your ingenious explanation of the correlation of Catholicism, militarism &c. My own is, I suppose, substantially the same, namely that it represents the triumph of the [end p. 6] emotional instincts over the rational elements. That this is so reflection will bear out. You will remark that in the last resort, the apologists for religion, for conservativism, for war, for art, (as you have properly mentioned that), for Bacchus, rely on appeals to the emotions, regardless of utilitarian or practical considerations, which these latter predominate in the unholy host of Protestants, atheists, pacifists, Philistines, eugenists, temperance fanatics, and socialists. Even where one may agree with any of the latter, they leave one cold. 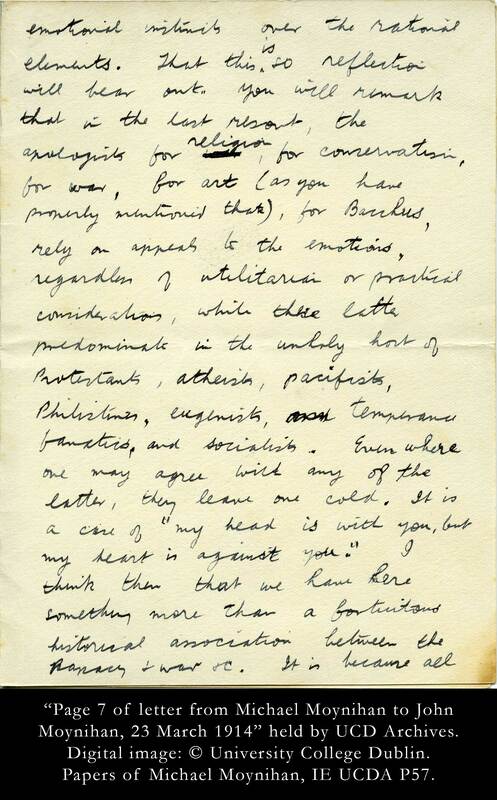 It is a case of ‘my head is with you, but my heart is against you.’ I think that we have here something more than a fortuitous historical association between the papacy & war &c. It is because all [end p. 7] these things are products of the same type of mind that they are so constantly found together. I think that “The Law of Civilisation and Decay” throws some valuable light on the subject, although the author’s dissecting-room methods are very disgusting. You need not send me any more books at present. I have all the Crawford series to go through yet, and no prospect of doing it.